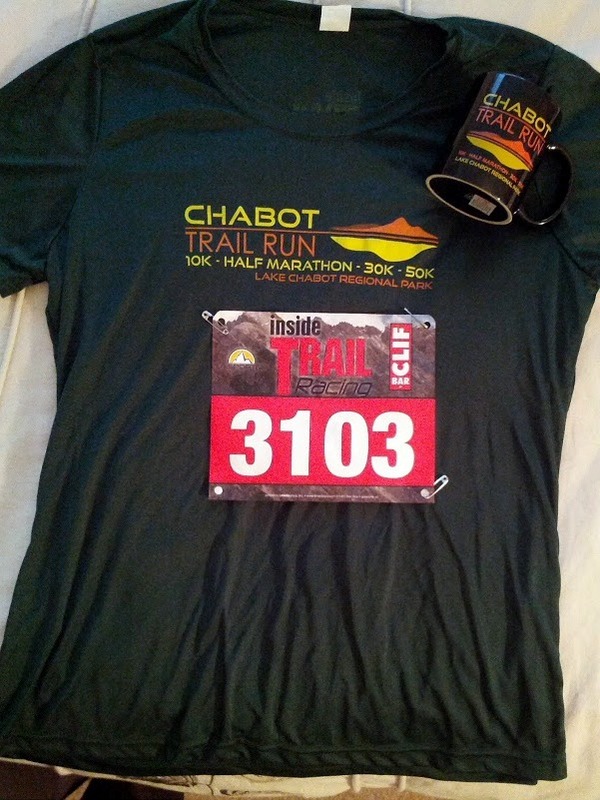 On Saturday, I ran the Lake Chabot Trail Half Marathon in Castro Valley, CA. 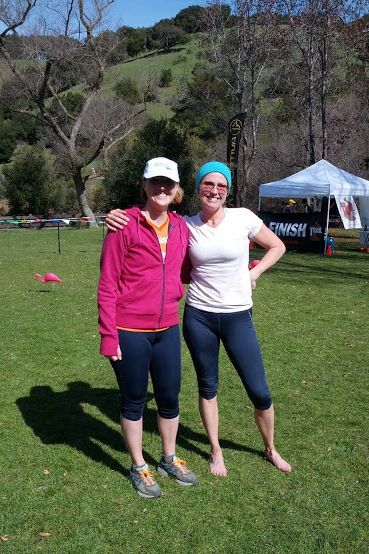 It was my first Inside Trail Racing event, and I was very impressed with the race organization. I've been trail running for a few months now, but this is only my third trail race event; I love how much more laid back the races are and how everyone seems really into it. I know I am! Exploring new trails and parks is a fantastic way to spend a day. I didn't go into this race with specific goals, I wanted to run the hills as much as I could and use it as a hard training run. I ended up feeling really good, the weather was cool but sunny, and the lake views were pretty. This half didn't have as much elevation gain as many trail races and parts were on paved bike trail, so it was definitely easier than the other trail races I've done. 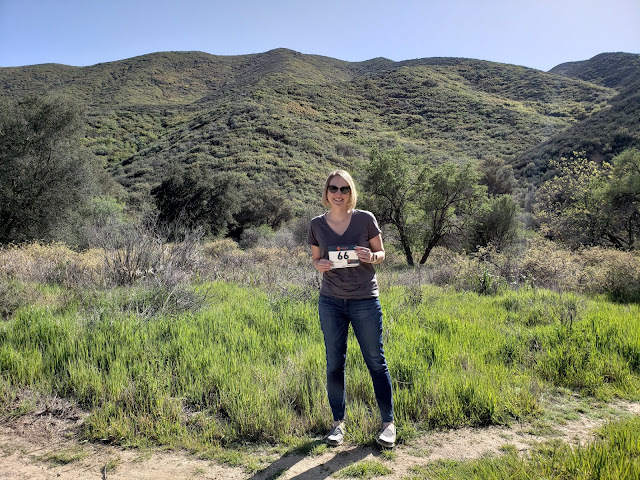 The drive was only about 40 minutes from San Jose and I was there in plenty of time to get parking, pick up my race bib, and to chat with friends. I knew quite a few people running this one and met a number of others I'd only 'met' before on Twitter, so that was awesome! The race director gathered us all at the start area, gave directions on how the trails were marked and a few things to note, then sent us on our way. The first couple of miles were on paved bike trail, so we got a good start with easy miles. Around mile 2 I confirmed that yes, I did overdress again, and I took a short break to remove my long sleeve shirt. I was wearing my hydration pack so that is easier said than done, but I was a much happier runner without the extra layer. When will I learn not to wear so much? Never it would seem. I had time to chat with with Brian, Pavement Runner, at the start and grabbed a quick photo too. 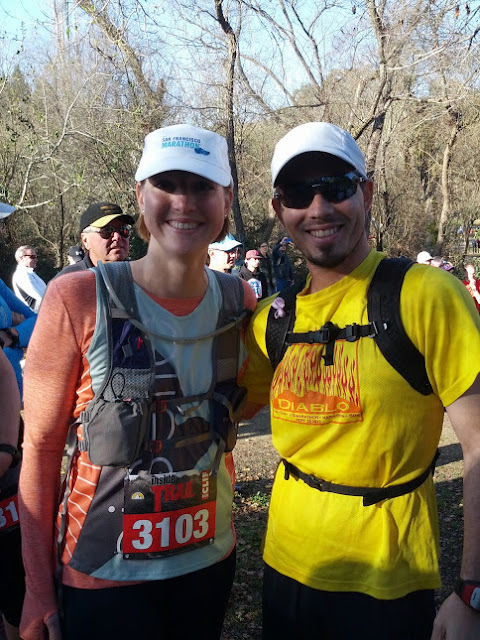 He was running the 50K in preparation for his next 50 miler. Impressive! Quick photo op with Pavement Runner! The first big climb ended at the aid station, where I took a quick break to get sport drink. I had some trouble finding it because everything sitting out was pop; I've never taken pop during a race so I'm not sure how that would go, but then again I don't generally drink it ever anyway. After a minute or so I was on my way. I think the half marathon was smaller because I felt very alone on the trail after the 30K split around mile 8. It was nice but also strange enough to have me wondering if I took a wrong turn. I sort of wish I'd done this 30K, but I wasn't prepared for that right now. I went through the second aid station quickly and then started to get passed by the 30K leaders. I love how fast and strong they are, fun to watch them run! During the last uphill in mile 12 I was starting to feel tired, but I saw Christy from the Oiselle sales team and that motivated me to the end. So much fun to cheer each other on! Christy was running a total of 26 miles at the park to train for her 50K. Posing with Christy after we were both done running. The last couple of miles were back on the paved bike trail around the lake, and I came into the finish line at 2:23:27. I'm very happy with that for a mostly-trail race! I felt awesome after the race, and I hung around to wait for friends in the 30K. The race had a ton of finish line food options, including Cheez Its, which I've now determined are my post-race food of choice. I usually have trouble eating solid food for a while, but I had no trouble with those! We received our race goodies at the finish line, and the race swag was a big highlight. They gave us nice tech shirts and coffee mugs. Coffee mugs! Shirt is dark green, hard to tell here. Love the mug! After the race, I went out for burgers and beers at the Englander in San Leandro with friends, where I had one of my fave IPAs - Pliny the Elder. Great end to a great day! Great job out there on the trails! I'm so excited to be doing lots more trail running this year. It's feels like such an adventure every time. The shirts they gave out are cool too. Thanks! I'm loving the adventure too, just so different and fun. Love the great outdoors and being in the woods! Hey, great job out there! It was nice to finally meet you. Sorry I was so scatter-brained as we chatted while I picked up my shirt/mug... we were in a hurry to get out & I kept wondering why the line wasn't moving, haha. Hope we have a chance to run again soon so we can catch up more for real next time! Great work Paulette! 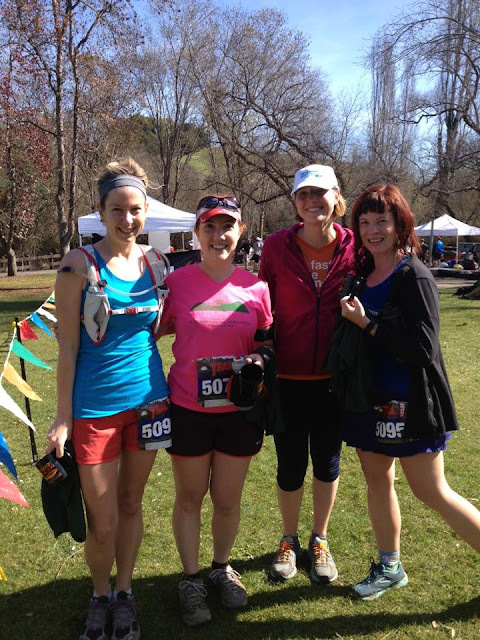 I am inspired by so many folks doing trail races this year! Great job Paulette...nice time!! I really need to try some of this trail running thing, looks like fun! Yes I've heard Brazen does one there too, might have to check it out! Great Job! Sounds like a great day, all around. Great job on your trail half marathon! Sounds like so much fun!! I think I want to try getting out on the trails and checking it out sometime. Thanks Kristen! I love it, you should definitely check it out! Yay mugs! Great recap - what a fun day. It was so nice to meet you. I hope we can run again soon. I hope so too, great to meet you! So much fun! Thanks for the "trail scare!" ;) Can't wait to see you again this weekend! I have never done a trail race before, but I really want to do one this year. Although I have to admit I am a bit nervous about feeling alone or lost if there aren't many people on the trails. You should! During a race, I bet there will be people around almost all of the time and the courses are marked. Thanks! They are harder and quite different, but I just love it. So much more laid back and just FUN! very ladi back indeed, ty for the post.